People with an Aquarius birthday will find their rising signs here. Find the date you were born. To the right of that column look for the nearest hour/minute to the time you were born that is before your birth time not after it. The zodiac sign you see in the box next to it is your rising sign. 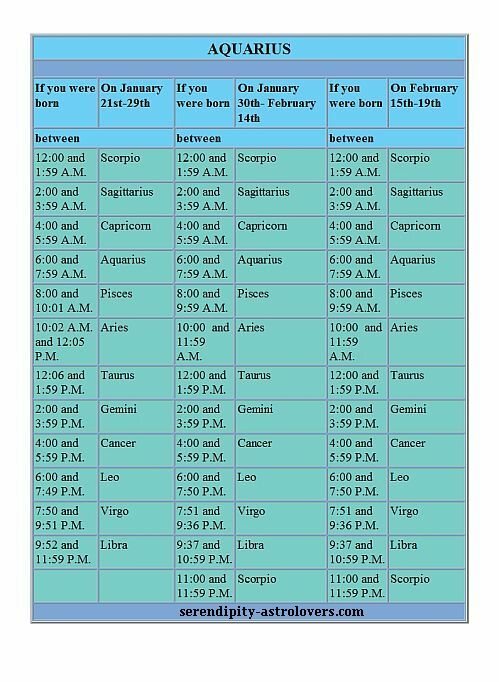 Some Aquarians may not know their birth time, an astrologer can provide a good rectification chart. What an Astrologer does to ascertain an ascendant through a rectified chart is he/she notes what the major events happen and when they happen. Some of the estimated rising signs here may disagree with what a chart you have done says. There is an explanation for that. You may have seen other tables on other websites that say you have a different rising sign. Well, I'll attempt to explain that too. Each sign takes 30 degrees on the zodiac circle. Another thing is that since the Earth spins on an angle the signs don't take the same amount of time to come up. We wind up with quicker and slower rising signs. People born in the Southern hemisphere will have a "quick" rising sign(short ascension) and people born in the Northern hemisphere will have a "slower" rising sign (long ascension). This table is for every year no matter what year. You should try to use the right birth time. If you don't have that, your closest guess is better than no birth time at all.